The 4 simple ingredients are natural with no extra funky preservatives or gunk. These “fudge babies” try to mimic real chocolate fudge and though I admit, they’re not exactly the same, they’re close enough and are delicious in their own way. The dried fruit gives them that chewy texture with a hint of fruity sweetness. Feel free to add more dates or agave nectar if you want it to be sweeter. The nuts give this snack some oomph and help keep everything together. It’s crucial, though, that you use good quality cocoa powder. Because you are using so few ingredients, each one plays a key role in making these the perfect study break snack. 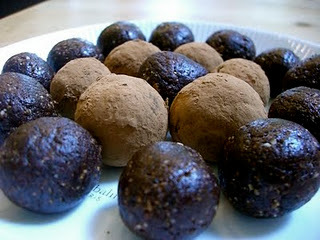 To make these visually appealing, I coat them in some cocoa powder or cinnamon, perhaps powdered sugar would work too! When it’s midnight and you’re about to reach for your secret stash of hersheys, snickers, or even slowly make your way to the vending machine, stop yourself: these fudge babies are waiting for you. Add all of the ingredients together in a food processor and blend until smooth. Roll into bite size balls. Roll them in extra cocoa powder or cinnamon. I make these regularly…so addictive and so yummy! Sometimes I mix some coconut powder in there too for an extra boost!